These two-season (Spring/Autumn) gloves are instantly comfortable, moulded to set the hand in a gentle curve, while a wide strap Velcros round the wrist, ensuring they stay on. The palms are reinforced with a suede-like material which is ideal ain the rain as you can use the entire palm to wipe your visor. I’ve been wearing the Vigos since the turn of the year; in that time the temperature has dropped to as low as -3°C, and there have been some heavy rainstorms. Above zero my hands are lovely and warm; it’s only below this that the chill gets to my hands; the ends of my digits get (very) cold, but importantly I am able to bend my fingers meaning I remain in full control of the bike. Not a drop of rain has got past the lining and the breathable layer wicks away any moisture with my hands staying dry (and the lining in place!). Downsides? The wrist fitting means the Vigo gloves slot inside the sleeve (as opposed to over like a traditional gauntlet). They work fine with the Akkor jacket (from the same manufacturer), but I could not do up the sleeves on my old Hein Gericke jacket, and with Bering’s own Scalp leather jacket it was hit and miss. Even with the Akkor, you have to make sure the cuffs are tight enough or a stream of cold air shoots up the sleeves. 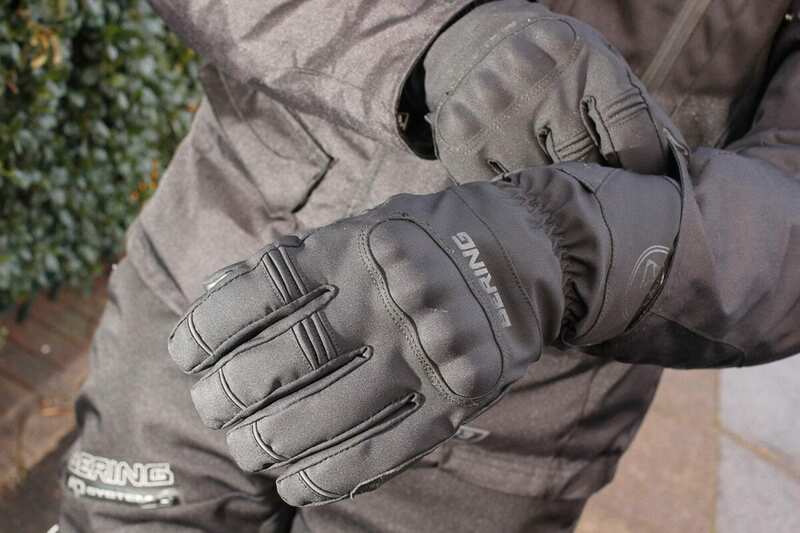 The Vigo gloves have exceeded expectations and handled a cold winter very well, but do try them on with your jacket to ensure you can do up the cuffs.